What does the electronic spark control module do? 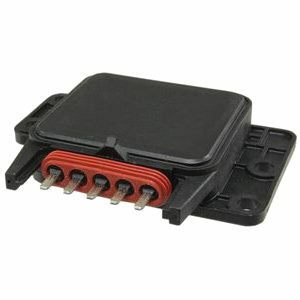 Your car’s engine is equipped with several different modules that detect signals and improve engine operation. The modules and sensors adjust your car’s running conditions to allow for optimum engine performance. The electronic spark control module (or ignition module) is one of these modules. Its primary function is to adjust ignition timing according to operating conditions. This allows for an improvement in engine performance and efficiency. Inside the engine, air and fuel are mixed together at an ideal air / fuel ratio. The spark plugs then create a spark that ignites the mixture and creates the necessary power to run the engine. If the spark plugs create too many or too little sparks at the wrong time, the engine will not run correctly. The spark control module adjusts the timing of these sparks to ensure fuel is burnt correctly. Engines require optimum ignition to run properly. Like other ignition components, problems with the electronic spark control can lead to problems starting your vehicle, or keeping it running once it has started. If no spark is created in your engine, the air/fuel mixture will not ignite and the engine will not be able to start (or remain running). Stalling while driving – When the spark control module fails to deliver a spark when necessary, your car may stall. This can be followed by difficulty starting your car again. Car cranking but not starting – A faulty spark control module can lead to there being no ignition spark in your engine. This prevents the engine from starting. If this is the case, your car will still crank but the engine will not start. Increased fuel consumption – Any issue that affects the burning of fuel can have a negative effect on your car’s fuel economy. When your engine misses an ignition cycle, fuel will often go to waste. Reduced engine power – A missing spark can also cause a decrease in engine power. This can translate to reduced speed, misfires and rough engine idling. Is your car in need of a spark control module replacement? If so, we can help! At Grimmer Motors, our team of experienced mechanics can easily diagnose, repair and replace ignition components such as the spark control module. A new module will allow your car to start without a problem and improve your engine’s performance and fuel economy. For new spark control modules in Hamilton, contact Grimmer Motors today!